The Beinecke Library’s collections include numerous pieces of art. In preparation for the renovation, the artwork was moved from the 121 Wall Street building. Many pieces, including the two Picasso-designed children’s chairs from Gertrude Stein’s Paris salon, were shipped to a specialized warehouse in Massachusetts for storage. In addition, about a dozen paintings were loaned to the Yale University Art Gallery. 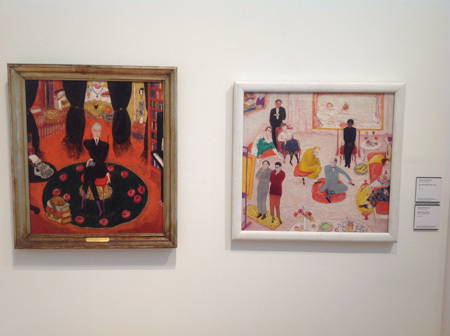 Five are currently on display in the American galleries: Florine Stettheimer’s Carl Van Vechten and Studio Party (pictured); and Collection of numbers, designs, and letters; Abstract arrangement of American Indian symbols; and Portrait of Berlin by Marsden Hartley. In early May, the Gutenberg Bible will be moved to the Art Gallery, and the double elephant folios of John Audubon’s The Birds of North America will be relocated to the Yale Peabody Museum of Natural History.